On Thursday the United Nations General Assembly’s Human Rights Committee adopted a new resolution censuring Iran for its violations of human rights. This is the 65th U.N. resolution condemning Iranian regime’s human rights record. 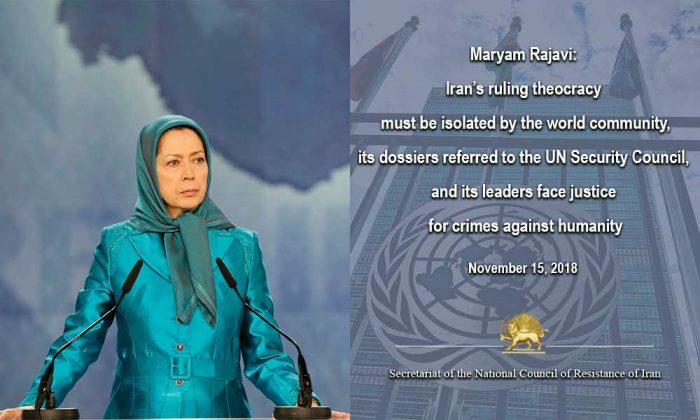 Mrs. Maryam Rajavi, President-elect of the National Council of Resistance of Iran, welcomed the U.N. resolution. “Condemning the systematic and gross violations of human rights by the theocratic regime ruling Iran, the UN resolution once again confirmed that the regime blatantly tramples upon the Iranian people’s most fundamental rights in all political, social and economic spheres,” she said. The Iranian regime is responsible for half of the world’s executions. It censors information going in and out of the country, in an attempt to control its citizens and prevent the international community from knowing the full extent of the mullahs’ crimes. The regime frequently denies legal representation to ethnic and religious minorities, and it detains and imprisons peaceful protesters for speaking out against the regime. International human rights groups have repeatedly intervened on behalf of Iranian prisoners who were denied due process and basic human rights. The mullahs have ignored all of these pleas and every act of censure and condemnation. The Iranian Resistance asks that the international community turn over all records of the Iranian regime’s human rights violations to the United Nations Security Council. It also asks that the international community recognize the right of the people of Iran to rise up against this regime. 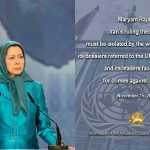 In her statement about the 65th Resolution, Mrs. Rajavi spoke about the Iranian regime’s mass execution of 30,000 political prisoners in the summer of 1988. The murders of these men and women, who were mostly MEK members or supporters, remain unpunished to this day.